1) In the main interface, click Mail in the upper-right. This will open a new window, the Email Manager. 2) Type your text in the editing section of Email Manager. 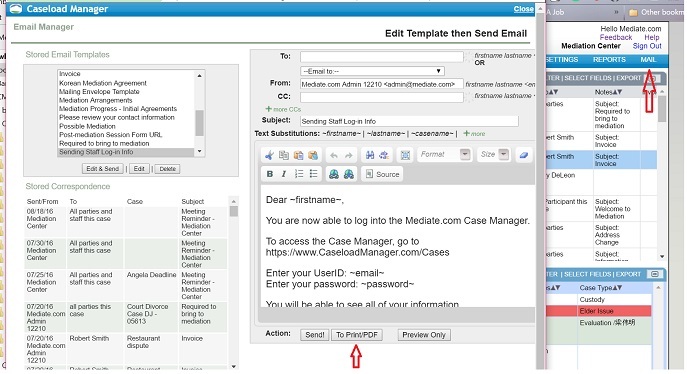 Or you can click on an email template in the Stored Email Correspondence, then click Edit & Send. 3) After you have entered the necessary text and/or Text Substitutions, click Print/PDF. This sends the merged information to a new internet page. Click on your internet options to save this to your desktop as a pdf that you can save as a backup. You can also print this to send out personalized letters to your clients!